Children are welcome to our regular worship services, no matter how young. It's ok to be a little noisy sometimes - we love knowing there are so many kids in our congregation! Young children are encouraged to participate in worship through First Communion, BLAST Sunday School, and special liturgies. Children and Youth also often participate in summer camp at Rainbow Trail Lutheran Camp, both as participants and later as counselors. There is so much going on here at LCHope, and plenty of opportunities for kids to just be kids! Kid-friendly music groups, such as tone chimes and children's choir are a popular outlet for little ones, as are special productions throughout the year - whether it's acting in the fall play, singing during the Christmas program, or dancing during the annual talent show. We also host seasonal family nights, where kids are invited to various events such as movie night, taco night, games night, and more! 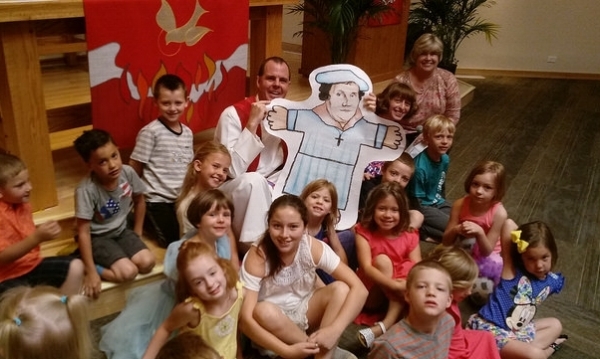 Other events include Trunk or Treat, God's Work Our Hands service projects, and Flat Martin. Middle and High School Youth are encouraged to participate in service projects throughout the year. Helping with Feed the Homeless, serving meals at Warren Village, and other opportunities to serve are available throughout the year. Our summer youth trips rotate between ELCA Youth Gathering, Service, and Mystery trips. Trips have been both local and international. Youth groups meet regularly on Sunday mornings and Wednesday evenings for faith discussions, fellowship, retreats, and more. Middle school-aged youth are confirmed in their faith with the guidance of a mentor from the congregation. The confirmation liturgy for youth takes place once a year. Youth in ninth grade enjoy activities throughout the year with an adult mentor. If you are interested in mentoring, contact Beth Rogers. Vacation Bible School is open to all church members, community members, family and friends. VBS takes place over the course of one week in July. Registration is available a few months ahead of time. Every year has a different theme - this June 4-8, 2018, the theme is "Shipwrecked!". Kids enjoy doing crafts, playing outdoors, learning and socializing.